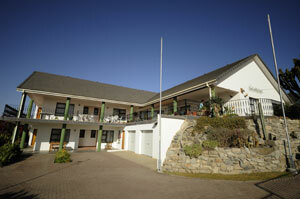 Luderitz hotels, accommodation and places to stay. 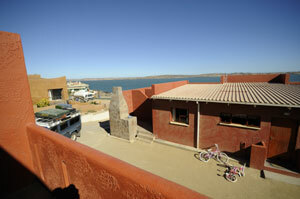 Guide to where to visit and where to stay in Luderitz Namibia. 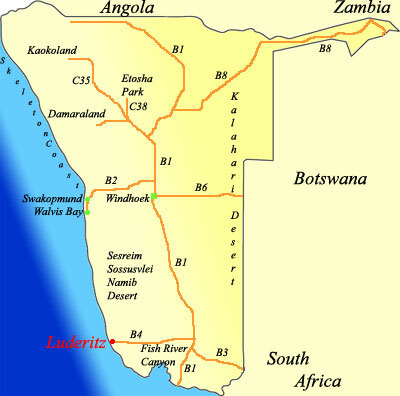 Information on Luderitz Namibia, location of hotels, lodges, camp sites, guest houses, bed and breakfasts and places to stay in the Luderitz area of Namibia. 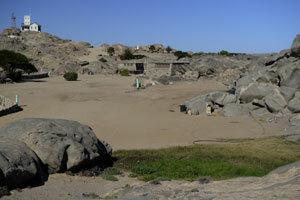 Distances from major attractions to Luderitz and information about shops, fuel and facilities. 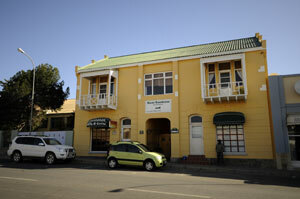 We are situated in one of the most beautiful and interesting towns in Namibia. 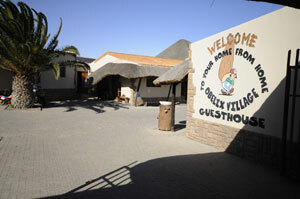 In 2003 Obelix Village Guesthouse was established. 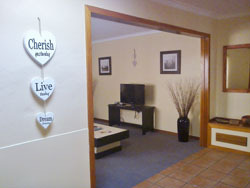 We offer an unique and warm stay for people that is tourist and business orientated. 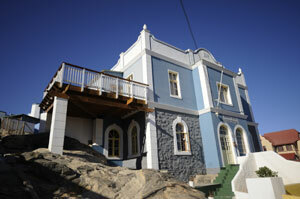 Hansa Haus Guesthouse is located in the town of Luderitz in southern Namibia. This traditional German house dates back to 1908 and sits in an elevated position at the top of Mabel Street, overlooking the town and the bay. Beautiful historic building which dates back to the German colonial era. Shark Island Resort lies on a peninsula in Lüderitz, Namibia and affords visitors sheltered campsites at budget rates, beautiful scenery and a rich history. 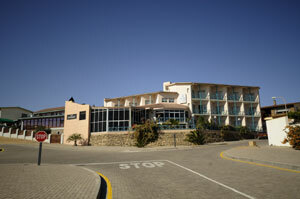 The resort is situated on Shark Peninsula, with an excellent view over the bay, town and harbour. Welcome to Krabbenhoft and Lampe Guesthouse! Overlooking the historic town of Lüderitzbucht, K&L Guest House is a fine example of the unique character of the early previous century. Built in 1910 during the diamond rush, it is used as a commercial building with residential facilities. Krabbenhöft & Lampe is the oldest existing company in Namibia, established in Keetmanshoop in 1880. 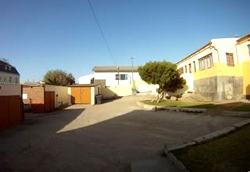 We have a small (3 unit) self catering establishment in Luderitz, Namibia. The idea of Element Riders came into being as a result of individuals who are interested in and practise some of the more radical outdoors sports. By participating in these sports one certainly learns to face and experience aspects of life, which one would not be exposed to under ordinary circumstances. It is these experiences which give rise to more appreciation of nature and life, the physical, philosophical and spiritual views of how these came to be and how they work. 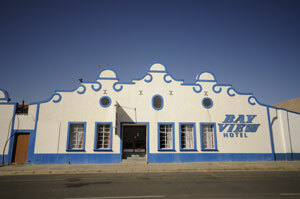 For comfortable and conveniently situate accommodation in Lüderitz, come to the Bay View Hotel, where the warm atmosphere and friendly staff will immediately make you feel at home. The Bay View's 20 comfortable and spacious rooms all have bathrooms en suite, direct dialling telephones, televisions and tea- and coffee-making facilities. 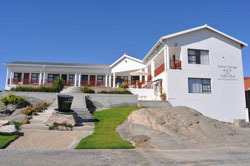 The Lüderitz Nest Hotel in the picturesque town of Lüderitz offers the holidaymaker and business traveller luxurious beachfront accommodation (70 Rooms) in a spectacular setting. 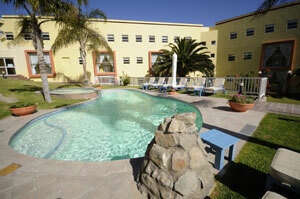 The perfect stopover for “Namibia” holidaymakers, business people and conference organisers and delegates. Sandrose House is often referred to as the “oasis in the desert”. It is situated in a peaceful garden in the centre of town. 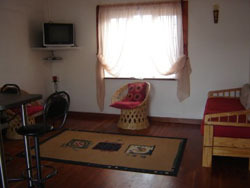 The rooms are neat, sunny, spacious and fully equipped. It offers accommodation for self-caterers. The host take pleasure in providing their guests with any information that will make their stay in Luderitz a memorable one. You will experience a new dimension of comfort in the Seaview Hotel Zum Sperrgebiet, situated in the picturesque harbour town of Lüderitz. Our 22 tastefully furnished rooms, 18 with panoramic views over the bay; all have bathrooms en suite, direct line telephones, coffee machines, radio and TV. Experience a new dimension of comfort at Zur Waterkant Guest House, situated in the picturesque harbour town of Luderitz in Namibia. 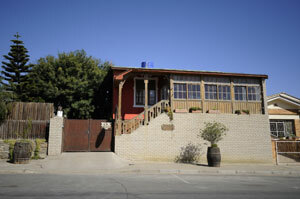 The guest house is situated in a quiet area of the quaint town, and offers accommodation in 4 double rooms as well as 2 rooms (up to 4 beds) equipped for self catering guests. 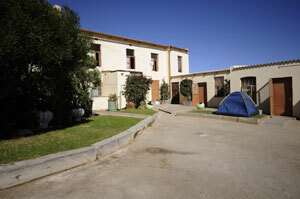 Your affordable accommodation in Lüderitz Centrally located, yet quiet and comfortable ! Housed in a historic colonial mansion, this friendly place is the only true backpackers' spot in town. Kolmanskop is a ghost town in the Namib desert in southern Namibia, a few kilometres inland from the port town of Lüderitz. It was named after a transport driver named Johnny Coleman who, during a sand storm, abandoned his ox wagon on a small incline opposite the settlement. Once a small but very rich mining village, it is now a popular tourist destination run by the joint firm NamDeb (Namibia-De Beers). Abandoned in 1954. The geological forces of the desert mean that tourists now walk through houses knee-deep in sand. 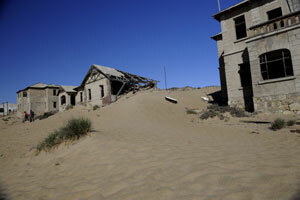 Kolmanskop is popular with photographers for its settings of the desert sands' reclaiming this once-thriving town. Due to its location within the restricted area (Sperrgebiet) of the Namib desert, tourists need a permit to enter the town.